CARRYS T4-R Tank is a full resin appearance atomizer with 5ml e-juice capacity in 25mm diameter. It adopts easy top filling, adjustable bottom airflow for huge vapor. It uses new U1 0.6ohm and U2 1.5ohm T4-R coil heads. CARRYS T4-R Tank is a full resin appearance atomizer with 5ml e-juice capacity in 25mm diameter. It adopts easy top filling, adjustable bottom airflow for huge vapor. It uses new U1 0.6ohm and U2 1.5ohm T4-R coil heads. Unique resin version. 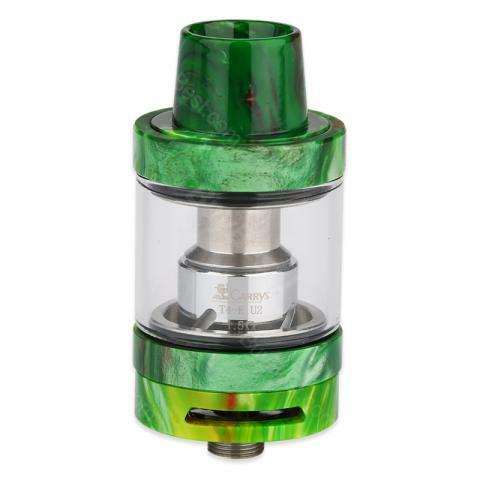 CARRYS T4-R Resin Atomizer Tank is a 5ml capacity tank with a stylish full resin appearance atomizer in 25mm diameter. Filling and bottom adjustable airflow. With included T4-R 0.6ohm and 1.5ohm coil heads, the T4-R Resin Tank can satisfy. OK the only difference between the two is the Baby being TPD/TRPR compliant and therefore coming in at just a 2ml capacity. This is a funky looking resin sub ohm tank designed for low wattage users – with coils between 10 and 50 watts.